With attention now given to the LA-Pasadena Light Rail line, I thought I’d better write some of my remembrances of the Monrovia line, which shared the Pasadena lines as far as South Pasadena and San Marino. As I start writing this, one of the last segments of the old line is rapidly filling with housing units. When I tell people I lived next door to a double track electric railway they will have a hard time believing it. I’m one of those rare birds, the Southern California Native. My birth certificate reads “Pasadena Rural” because the hospital was outside city limits in those days. St. Luke’s Hospital is still in the same place, but Pasadena has expanded eastward. A few blocks away is Sierra Madre Blvd, where a grassy median is all that’s left of the PE Sierra Madre line. I grew up on Fifth Ave. in Monrovia, on the north side of the PE right-of-way. From the time I was old enough to notice, to the sad days in 1952 when the track and trolley wire were ripped out, PE was part of my life. Here it is as I remember it, and as I have read about it in the works of Ira Swett and other rail historians. Typical weekday service was a car every half-hour to Monrovia, with every other car continuing to Glendora. Rush hours would see two and three car trains running on ten or fifteen minute headways. Add to this a daily freight train, a daily “box motor”, and assorted work cars, and there was a lot to watch. Most common cars were the 1100’s: there were fifty on the PE roster and I saw every one of them during the 1949-1951 period. Built in 1925, heavy steel suburban cars 1100-1149 were identical except for minor details. They had dual-door vestibules for faster loading and unloading, and although not designed as such, unofficial baggage space used for baby strollers, which were not as collapsible as the are now (you have to be an old-timer to remember when “Taylor-Tots” were the mother’s boon). 1100’s were specifically designed for the Monrovia and Pasadena lines, although they sometimes served on the Long Beach route. All were refurbished in the early 1940’s, receiving paint jobs inspired by the SP Daylight trains. (none of the other SP traction properties lasted long enough for this decorative touch). Most had Daylight-orange striping along the sides, but 1107, 1108, 1116, 1118, 1123 and 1127 remained plain. Most had modern interior lighting installed along the sides, but a few, including 1137, kept the original 1920’s style fixtures down the aisle. During off-peak hours they ran in single units, but rush hour would see two and three car trains. One night I saw a five car train, but it was probably a deadhead run to the Macy Street Yard, as the City of Los Angeles took a dim view of longer trains in city streets. 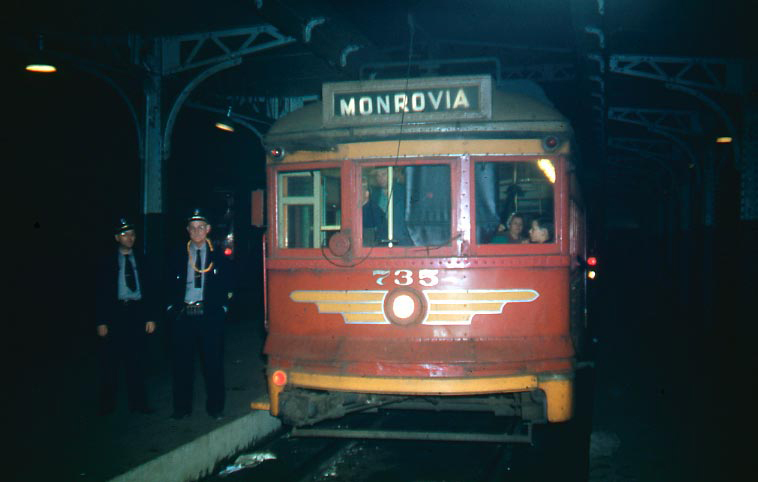 A feature of morning and evening rush hour was a three car train of 1200-class cars, which were originally built for the San Bernardino and Long Beach lines, but were available for Monrovia service because of cutbacks and replacements on those two lines. 1200’s were a motley assortment, the two things they had in common were single-door vestibules and the capability of running on 1200-volt trolley current. I probably saw most of the 12’s, but the cars that were most distinctive were 1216-1221, which had flamboyant paint jobs, and 1252-1263, which had porthole windows on the ends and stained glass upper sash along the sides. Although 1200-1215 and 1222-1245 were actually two separate classes with considerable technical differences, they looked the same to the young observer. They would be mixed and matched for the rush hour special and spotting the Twelves was usually the high point of a PE-watching day. In addition to the types mentioned above, big racing days at Santa Anita would bring out the real exotics: Combination express-passenger cars (combines) of the 1370 and 1372 classes, and trailers (non-motorized cars) 1246-1251. These were often set up in three car trains with a combine on each end and a trailer in the middle. Trailers were never seen on daily rush hour trains, presumably because they slowed acceleration unacceptably on trains that had to make many stops. 1370 and 1371 were the combine mates to 1200-1215, while 1372 through 1376 were of the owl-faced type like 1252-1263 (I later learned that this group came from the Willamette Valley of Oregon, where they ran on electrified Southern Pacific lines from 1912 to 1929.) The only 1200-class car to survive is the most exotic of all–business car 1299. This unique unit started as a refugee from Oregon, and was extensively rebuilt by PE, being fitted with extra-tall end windows, a small galley, amidships restroom and parlor-car seating. It came through Monrovia on the last week of service, with a party of railfans. In 1957, it made a visit to Arcadia on the former SP Duarte branch, which remained in use one block south of the PE passenger line up until about 1961. For this trip a diesel switcher provided motive power, since there was no PE trolley wire anywhere near the San Gabriel Valley. by that time. My mother took movies of this rare event with the then-new family camera. 1299 was for many years on static display at the LA County Fairgrounds, along with seven steam locomotives and the former Santa Fe Arcadia station. It has finally joined the other surviving Red Cars at Orange Empire Railway Museum in Perris, CA, where plans have been made to restore it to running condition. It has been run as a “trailer” with OERM’s PE “Blimps” on special occasions–it needs some repairs to the electric system but the air brakes have been restored. The 1200’s (at least the “native” cars) appeared to be contemporary with the 1100’s, but really big race days would bring out the 1000’s. These wooden interurbans would be in three car trains; the cars I remember were 1002-1019, although I later found there were others up to 1057. They looked considerably older than the steel cars, but were actually only two or three years older. Instead of the multiple-unit couplers of the 1100’s and 1200’s, they had standard railroad couplers and air hoses, with heavy jumper cables for the control circuits. One day I talked my mother into taking my brother and me out to the storage track on the east side of Monrovia to get a closer look at these relics, not knowing they ran in daily service to Santa Monica and Venice. Only one car of this class survived: 1001, which was converted to a rail grinder in the 1940’s and thus would not have been seen by me on any racetrack specials. It was purchased from PE by the late Walter Abbenseth in 1955, and stored at Travel Town in Griffith Park until 1958, when it was moved to Orange Empire. It does not run in regular service because the modification into a work car weakened an already tired body, and it also has some motor problems. Nevertheless, it is the only operable original PE interurban car. The biggest of the Big Red Cars were the so-called “Blimps”. Like the 1100’s, they had double vestibules, however they were considerably longer. I later learned that the Monrovia line was the only place they were used outside of the Long Beach line and its branches. They probably would not have worked on the streetcar curves of Pasadena and they were not set up for the 1200-volt line to San Bernardino. In our household, they were not called “Blimps”, but were known as “Missions”–not for any connection with early California, it was short for “U. S. Maritime Commission”, which appeared on the letterboards of some of the cars. One ex-PE motorman I knew called them “Bombers”. They were seen in Monrovia on race days during the last year or two of rail service. I recall seeing both the 300’s and 400’s going to the storage track, and once rode one when it was in regular service to Monrovia (this may have been a New Year’s Day when all the 1100’s were needed in Pasadena, or possibly a test run of some sort). Some Santa Anita specials would be made up with combines 496 thru 499, usually with a 300-class car in the middle and a combine on each end. 498 has survived, and I have run it several times at the Orange Empire Railway Museum. One day I was the only operator qualified to run “Blimps” and 498 was the only standard gauge electric car available for main-line passenger service. It was a slow day, so we only ran every 30 minutes, but I was still able to rack up about 20 miles of travel on the museum railway–equivalent of running from Monrovia to Los Angeles! During the last few months of rail service, center-entrance cars in the 600-759 series covered all the schedules. Years later I learned that the 1100’s were kept until the end of the Santa Anita season (around the end of March) and then sent to New Orleans for shipment to Argentina, where they worked on a third-rail powered suburban line out of Buenos Aires. The “new” cars were lower and less impressive than the 1100’s, but they had one great advantage–there was a seat up front where small boys could watch the motorman run the car! Occasionally we would get a 5050-series car, which had a toolbox instead of a seat, but usually we would ride up front and then be let off at the front door, where we stepped off on the folding step. We always boarded at the middle doors, where the conductor stood–the front door was for exit only, at least on the Monrovia line. I remember riding 686, but the most common sub-group was the 732-759 set some of which had been upgraded for San Fernando Valley service in the late 1930’s. Like the 1100’s they ran singly and in two and three car trains. One of these cars survives in operating condition at OERM; 717, which has been repainted into a shortlived color scheme used on Valley cars in the late 30’s. It has since been repainted into the Electric Lines Red that it wore in the 1920s and 30s, and has also received a lot of body repairs and mechanical rehabilitation. Three others exist at Orange Empire, all needing various repairs before they can run again. 637 has been repainted into the mid 1940’s look, 626 and 716 are still as-bought from LAMTA in 1960, with ghosts of various paint jobs fading in the Perris sun. The body of 655 survives, having been modified to run on truck axles. As of June 2007, the body is on demotorized trucks, having been taken off the rubber-tired assemblies and restored to a railway car at OERM. The cars that we couldn’t ride were even more fascinating to me. The oddest was Tower Car 00150, the wire greaser. When I was a boy I thought it cleaned the wire; after I joined the museum, I learned that it greased the wire so solid trolley shoes could be used. It’s basically a flat car (said to date back to 1899!) with a wooden tower on each end and a cab in the middle. Every Monday afternoon, 00150 would make its rounds, with a worker in one of its two towers. It survives at OERM, but in very decrepit shape. The other PE tower car in the collection needs body work, but still runs. 00157 was built in 1917 to take care of the 1200-volt San Bernardino line, and still has some vestiges of 1200-volt equipment. It also worked on the 600-volt Monrovia line, and I saw it several times, wondering what sort of electrical woes had caused its mission. I’ve run it several times at the museum, where it has been used over the years for many electrification projects. A useful feature is the “hot feed” trolley wire reel–by throwing a knife switch, the pulleys that guide new trolley wire from the reel inside the car to the overhead installation can be connected to the car’s power wiring, allowing it to draw power as the wire is paid out. This is rendered less hazardous than it sounds by the mostly-wood construction of the car. Another rarely-seen work car was 002, the wrecker. Built to the same plans as 00157, but without the roof deck or tower, 002 was used to take jacks, blocking, chains and workmen to derailments and other car mishaps. Pappy referred to it as the “Chain Car”. I only saw 00191, the electric crane once or twice, but it was one of PE’s weirdest-looking units, a boxcar with a derrick mounted on one end. The last self-propelled unit I saw on the Monrovia line was crane 00194. An Ohio Locomotive Crane product from the 1920’s, it was an oil-burning steam derrick, accompanied by tender 0014. My first railfan photos were of 00194 dismantling the Eaton Wash bridge, not far from where I live now. Freight activity usually consisted of a daily train pulled by one or two electric locomotives. These were often motors of the 1619-class, built in PE’s own shops in the mid-1920’s. 1624 survives at Orange Empire, still operable but needing much work to get it back to good condition. I never saw locomotives running in MU–the track was in bad shape in several areas, and they probably didn’t want a concentrated load in one spot. Major traffic was rock products from the Consolidated quarry in Azusa, carried in drop-bottom gondolas. Most unusual sight was the Clyde Beatty Circus train, which came through from Azusa or Glendora one morning with (I think) 1619 on the point and 1621 helping in the rear. The circus set up in Arcadia on what is now an industrial area but what was then a huge open field. The following year it was pulled by a diesel and set up where Arcadia High School is now. If the circus came to town the year after that, it was on the Santa Fe or in trucks, for the PE was gone. When I was in fourth grade at Monroe School, the westbound freight rumbled past around 1:30 PM on its way to Los Angeles. The City of Monrovia had installed a stop sign at Olive and Mayflower, where the track left street-running and resumed private right-of-way, and I’d hear the hiss of air brakes and the clanking of the train coming to a halt. The head brakeman probably got off to flag the crossing, and the engineer (by this time the electrics had given way to diesel power) would turn on the air-operated bell and start up with more rattling and clanking as the slack pulled out. Whatever was under discussion in class was totally lost to me. Express traffic and LCL (less-than-carload) freight was hauled in an assortment of “box motors.” Basically self-propelled baggage cars, just about any type that PE had might be seen on the Monrovia line. I would usually see the inbound run around 3 PM. It might be wooden, of the same lineage as 002 and 00157, or it might be a steel unit, either purpose-built or modified from a passenger coach. The biggest box motors were 1465 and 1466, which I later learned were hand-me-downs from SP Bay Area electrification. 1465 survived into the 1970’s as a building in the SP Bakersfield Yard. Some were obviously former Portland coaches, with the stained glass painted over and steel plates over the windows. Box motors always had wheel trolleys, since they went where the trolley greaser did not make its rounds. As the cars headed into Arcadia, there was a bad spot on the trolley wire where the wheel would lose contact and make a big arc. Diesel locomotives started appearing on freights in the late 1940’s. The first were small center cab units that I later learned were GE 44-ton locos with Caterpillar power plants. They had trolley poles to actuate overhead signal contacts so I thought 1650-class was a new kind of electric. Monrovia line service probably took them right up to their design limits. One night in December (probably 1949) I saw 1022 go by, reading its number from the illuminated glass on the hood. This was one of two Baldwin VO660 units that were regular sights on the line. It and 1021 were lettered for PE but actually belonged to Southern Pacific. I used to wonder whether PE ever got the diesels mixed up with wooden interurbans 1021 and 1022, but they may have been out of service by then. Other Baldwin units were 1322 and 1327; they all had relatively low speed prime movers, leading me to believe that the “mill” would idle in wired territory and the dummy trolley poles were actually powering the unit. Occasionally an EMD SW1 would show up, usually 1011 or 1014. These are gone, but 1006 is preserved at OERM, and still has a “tee” fitting where the air pipe to the trolley whistle valve was connected. As late as the mid-1970’s, diesels used on former PE lines in Santa Monica, Beverly Hills and West Hollywood had interurban-style whistles and engineers (some of whom were ex-PE motormen) were forbidden to use regular air horns on the “Westside.” Back in 1968 I was in LA for an ERHA/SC meeting, and decided to check out the Hollywood Midnight Switcher. It was either 1011 or 1012, and I found the crew switching on Santa Monica Boulevard. After the switching was completed, I followed the unit all the way through Beverly Hills, soaking up the mellow toot of the air whistle and the rumble of wheels on well-worn rails. Today traction has returned to the San Gabriel Valley, but on the former Santa Fe 2nd District from LA to East Pasadena. Metrolink diesel trains use some of the old PE routes, but it just isn’t the same. In a real “who would have believed it” event, Santa Fe 3751, first of their 4-8-4 “Northern” locomotives, restored to action in 1991, hauled a three car special train to San Bernardino on the Metrolink San Bernardino line in 2004. A considerable part of this route is ex-PE, and some even covers a segment used by the Monrovia Line. To find real traction action with all the right sounds (except for the air whistles), one has to go to England, where the Southern Electric lines on the south side of London run on DC third rail (great for Chicago interurban fans who miss the CA&E) with cars that have electric air compressors and big traditional traction motors. The first Spanish word I learned as a small boy was “agua”–from the Mexican track workers who would ask to fill their water containers from our front yard faucet. They would arrive at the Fifth Avenue grade crossing on a gasoline-powered section car, usually pulling a trailer laden with tools and material. With a mighty team effort they’d wrestle the four-wheeled cars off the track, far enough to be well clear of trains. At the end of the day, they used the pavement of the grade crossing to help rerail the cars, which were started with either a crank or a good steady push by the workers. The crew lived in humble quarters adjacent to the track between Santa Anita Ave. and Huntington Drive in Arcadia. This area has been completely redeveloped and no trace of the PE remains. Sometimes a track crew would show up in a converted transit bus from the late 1920’s; I think the number was around 01030. It was a front-engine coach with big air shock absorbers right behind the bumper. The door was controlled by brass handle and a mechanical arrangement–like a school bus. The PE Azusa Substation building survived until early 1999, but was demolished as part of a redevelopment scheme. Used for many years by a steel company, it sat beside track that once carried Big Red Cars but now is a dead end freight spur. Another sub was in Arcadia, just west of Santa Anita Ave. near the track workers’ dwellings. Up until late 1951, they emitted mysterious humming noises, which I later learned were from transformers and motor-generators which took 15,000 volts from the Edison system and turned it into 600 volts DC for the railway. The Arcadia sub survived as a lumber yard building until about 1961, but was demolished and like the track crew housing has left no trace. The only other surviving buildings in the San Gabriel Valley are the Pasadena Sub, adjacent to the municipal power plant, now used by the city; the Altadena Sub, which was made into a real estate office several years ago and the former Vineland Sub in Baldwin Park. I think Vineland belongs to the city of Baldwin Park now, but it’s too far away from the present track alignment to be incorporated into today’s Metrolink facility. A lifelong fascination with overhead power lines began when I became interested in the PE and Southern California Edison lines that passed my house. I found that the three wires on the top crossarm, supported by mushroom-shaped insulators were the AC feeders that went to the substations in Arcadia and Azusa (further in toward LA there were two AC feeder circuits). On the lower crossarm was a big glass insulator, which supported a very thick cable. On curves it was supported by a pair of porcelain spools, held together with a steel strap across the top. Thinner wires, presumably for telephone service were out on the ends of the crossarm. In the late 1940’s, flashing-light and gong grade crossing signals were added at Fifth Ave., which was a fairly busy street. I remember one morning when a man almost brought his car (I think my dad identified it as a 1929 Studebaker) to breakfast with us after coming out second best in a confrontation with the morning box motor. The electric crossing protection may have received a higher priority after this and other wrecks. More wires were added for this project, on clear glass insulators, with porcelain spool dead ends at the control box pole. I salvaged some of these and still have them. The mushroom style high voltage insulators are still seen in a few places in Edison territory, but PG&E has a pole line with several miles’ worth of these pre-1910 relics along the former SP (now UP) main line north of Chowchilla. It’s a strange thing to be nostalgic about, but this line makes the UP look like a dieselized interurban. I’ve also spotted quite a few on PG&E poles in San Francisco. A mid-1940’s addition to Fifth Ave. was a waiting house that the track gang brought in on their four-wheeled trailer. It was apparently moved in from another part of the system, either an abandoned line or a place where a more elaborate structure had been installed. The foundation lasted long after abandonment, being demolished in the mid 1990’s to make way for a housing development on the old right of way. Monrovia had a depot that lasted until about 1967; its last use was as a Christmas tree lot office. It was dismantled and the timber was last seen on trucks with Mexican license plates. The depots at Azusa and Glendora lasted a few years longer, but all locations have been covered by new construction in the intervening years. The great terminal building at Sixth and Main in downtown Los Angeles survives–the portal where once the mighty Red Cars headed for the suburbs now provides access to a parking area. It was the LA headquarters for Southern Pacific for many years, but is now mostly used for movie location and TV commercial filming. A recent article in the LA Times showed the PE Building as a candidate for remodeling into housing units; this project has been completed and I’ve had a look at one of the apartments. It’s very modern, but the corridors have an old-timey look. In Pasadena the car house spent twenty years as a bus barn, but the 1971 Sylmar earthquake damaged it beyond repair. Out on the San Bernardino Line, the Etiwanda depot was a lumber yard office, but is now preserved by the City of Rancho Cucamonga. The Rialto station is now a Mexican restaurant, having endured several years as a radiator repair shop. Pacific Electric’s track through Monrovia was in poor condition, and was mostly original 1903 steel. Any plans for retaining rail service past 1951 would have to include completely rebuilding the track. Construction of the Santa Ana/San Bernardino Freeway past Union Station canceled any hope of that happening by taking PE’s exit from downtown toward the San Gabriel Valley. The idea of building a grade-separated rapid transit line was discussed, but no business or political entity would ante-up the money. Thirty years ago, if someone had said, “The Long Beach Line, parts of the San Bernardino Line, and a section of the San Fernando Valley Line will reappear,” such predictions would be greeted with “dream on” and “what have you been smoking lately?” Traction fan gatherings would be devoted to slides and movies of long-vanished trolley lines, and plans for trips to San Francisco to ride the west coast’s last outpost of streetcar service. Today, between the four MTA electric lines and the seven Metrolink services, it would take a long day to cover even a good percentage of the lines. I was selling maps of the PE as it was in 1935 for the ERHA at the North Hollywood subway opening, and was able to point out where the Red Car routes once again see passenger service. At OERM, the Red Car era lives on, especially during special events, such as PE weekend, which has been observed during June in 2006 and 2007, and may become an annual event. Every ex-PE unit that runs comes out for photo ops and (if feasible) passenger service. Highlight is a three car train of “Blimps” on the main line: 200 feet and 170 tons of traction action. The 2007 celebration included adding 1299 to the Blimp train, which was done with an ex-SP switcher in the tiger-stripe paint job appropriate to the 1950’s. Visitors to the west side of the Los Angeles Harbor at San Pedro can ride replica Red Cars built under the sponsorship of the LA Harbor Department. The cars, which represent PE suburban cars from 1915 or thereabouts, run Friday through Sunday from the Cruise Ship Terminal to 22nd St. On stand-by duty is “PE 1058”, which started a hundred years ago as a Los Angeles Pacific interurban car and in its PE 950-class form was saved from the scrap heap by the late Richard Fellows, who owned a shipyard on Terminal Island. His craftsmen modified the body and extended it to replicate a PE 1050-class car. He then designed a rubber-tired undercarriage and powered it with a Chrysler V-8 engine. 1058, the “rubber tired interurban” participated in many civic functions and movie shoots until Mr. Fellows passed away in the 1990’s. I don’t know all the details, but the Harbor Dept. wound up with the car, and refitted it with electric railway trucks (from a Japanese suburban railway) and installed modern electric and air brake equipment. This project was made much easier because Mr. Fellows left enough of the structure in place to facilitate going back to “trolley power”. Talk about “having faith”–what a legacy! Our thanks to Bob Davis for this absolutely stellar monograph! – Ed. The author says “The crew lived in humble quarters adjacent to the track between Santa Anita Ave. and Huntington Drive in Arcadia. This area has been completely redeveloped and no trace of the PE remains.” Evidence of the PE does indeed exist in the area the author mentions. Cracks in the pavement show the exact spot where PE double tracks were buried beneath, and remains of the wiring and foundation of an interlocking tower can be seen if you know where to look. Good article! I’ll have go back and check–thanks for the “traction archaeology. Back a few years ago, when the Gold Line Foothill Extension was just getting started, my wife took a photo of me with a shovel where the lines crossed, doing an unofficial “groundbreaking”. Ironically, some of these traces may go away when construction of the Arcadia light rail station approaches begin. About two blocks north is the Arcadia information office where residents can get up to date info on the GLFE. It’s in the same building as the Arcadia Historical Society. My birth certificate also says “Pasadena Rural (Altadena)” … I may be an even rarer bird than you, Mr. Davis! I’m a 4th generation Southern California Native, also born at St. Luke’s (1943), who grew up in San Gabriel. Yes, St. Luke’s is still there, but no longer a hospital; the buildings are now part of Cal Tech. I don’t know a lot about the PE but am finding this website a fascinating source of SoCal history. I think I remember the Red Cars on Main St. in Alhambra when I was little. My 97-year-old aunt tells me about my great-grandfather riding the Red Cars into downtown L.A. from Rivera (I think) to do his Christmas shopping for her & her sisters. Back in the 1940s, my mother would take my brother and me into downtown LA every year or so for to go shopping at one of the big department stores. By the time the PE rail service to Monrovia quit, there were branches of the big stores in Pasadena, indeed, one of my aunts worked at the Lake Ave. Bullock’s for many years. For a look at what’s left of the hundreds of Red Cars, June 16-17 are PE Weekend at Orange Empire (oerm.org), when some of the rarely-run cars come out for a day in the sun. Bob, thanks so much for your reply … & the great news about PE Weekend at Orange Empire 6/16-17. I live on the Central Coast but will be in Ontario that weekend, w/ a friend who’s a big rail fan … we’ll be there! My mother took me to Bullock’s on Lake to see Santa every year. Wonderful store, now a Macy’s. Much later, I worked at Robinson’s in Pasadena … it’s now a huge Target store! My aunt also worked for Pasadena Bullocks from 1964-1965 & 1990-1996, and Macy’s from 1996-2008. My mom worked for Robinson’s from circa 1970-1972. Just starting my autobiography, I Googled, Pacific Electric and to my surprise found this wonderful website. My birth certificate actually says Monrovia, California, as I was born in 1936 in the Monrovia Hospital, that was just a house in those days. The PE was great transportation into Los Angeles, and my mother, sister, and I used to love to go to the big department stores. My grandmother was a model in the Tea Room of JJ Haggerty and we would have lunch and watch her model. Monrovia was my home until 1998 when I retired from City of Hope. I now live in Taylor, AZ, but Monrovia will always be home. My parents, my husband and I, and some grandchildren all were MAD grads. Too much to go into here, but would love to visit with any of you by email. I was born in Azusa in 1932 and lived there until entering the military in 1950. When I got old enough, we were able to ride the PE car from Azusa to Glendora to go bowling. I attended Covina High School and on Friday after school, I would often ride the PE car to San Dimas to visit my grandparents for the weekend. When I went in the service, I was stationed at Camp Cooke, Ca now Vandenburg AFB. We would hitch hike to Los Angeles and sometime have to wait for the PE station to open and then ride the PE car to Azusa. What a great way to get around. While Attending Covnia High School, the PE station was remodeled into a youth center with two dance floors, one inside and the other on the loading dock, a snack bar and games. My, those were the “good old days”. On one of my trips home, my future sister in law boarded the PE car I was riding in Pasadena and that night met my brother. They have been married over 60 years now. I was born January 22, 1922 at home, 141 North Azusa Avenue. Big red street cars took us everywhere in S. California. School trips to see “Old Ironsides” in San Pedro. We often took bicycle trips and then hitched a ride home on a big red car. Shopped in LA by walking from First street and the ranch about 8 blocks. I live in London (U.K.) but one of my perfect vacations is a visit to L.A. and the surrounding area to investigate old P.E. sites. We stayed in East Pasadena this year so this excellent article by Mr. Davis gave life and colour to an area I’m already interested in. The line half-way through the article was of special interest as our apartment is close to the Kingston loop, and apart from travelling on it frequently, I can (on a still night!) hear the trains from my living room. Ironically, while most of you writers are in amongst the history of this once great system, and although until I read this it had not occurred to me, I can still hear it! Great web-site and some seriously entertaining articles. Just west of Glendora, the Santa Fe (soon to be Gold Line) track was parallel to and just south of the Pacific Electric track. On one occsion we ran along side a PE 5050 car heading towards Glendora. How I wish this could happen again today. I am herefore looking forwared to the day when the Gold Line is extended past Glendora and the site I so well remember. My grandmother, my Aunt and I regularly rode on the red cars from Glendora to 6th and Los Angles Street for shopping. My favorite destination was Clifton’s Cafeteria which was decorated as a tropic island complete with waterfalls and tropic vegetation. The May Co and the Stationer’s Corporation were nearby. My Aunt told me that, occasionally, she had insufficient funds for the fare and the conductor would let her wait until the next ride to pay up! Just in case anyone has the impression that all used cars between Oregon and California went only southward, as it turns out some L.A. Railway cars went north to Eugene to be used on the Espee owned city lines. I’m sure someone here knows the full details. As to surviving remnants in the S.G. Valley…I recall the old trainmens’ building with the painted PE heralds was still sitting east of downtown along the freeway and rail lines in the late ’70’s. Was this all torn out? Alas, I was born at the big “K” hospital between Hollywood and Sunset right by the old PE junction area in East Hollywood. The last vestiges of the system were confined to the Southern District, but we still had the remaining LA Ry lines for a few years of wonderment. The Opel that was supposed to make life easier wound up in an accident, but it sure made an interesting relic in the ancient wood garage with all those glass pieces of the windshield on the seats. Busses!! Yuk!!! Thank God for thumbs and friendly drivers. Thanks! I know that you are far away but share our fascination with the PE.